We are pleased to feature this exquisite, monumental sized poster, hand signed by Robert Rauschenberg. A Robert Rauschenberg framed lithograph poster. 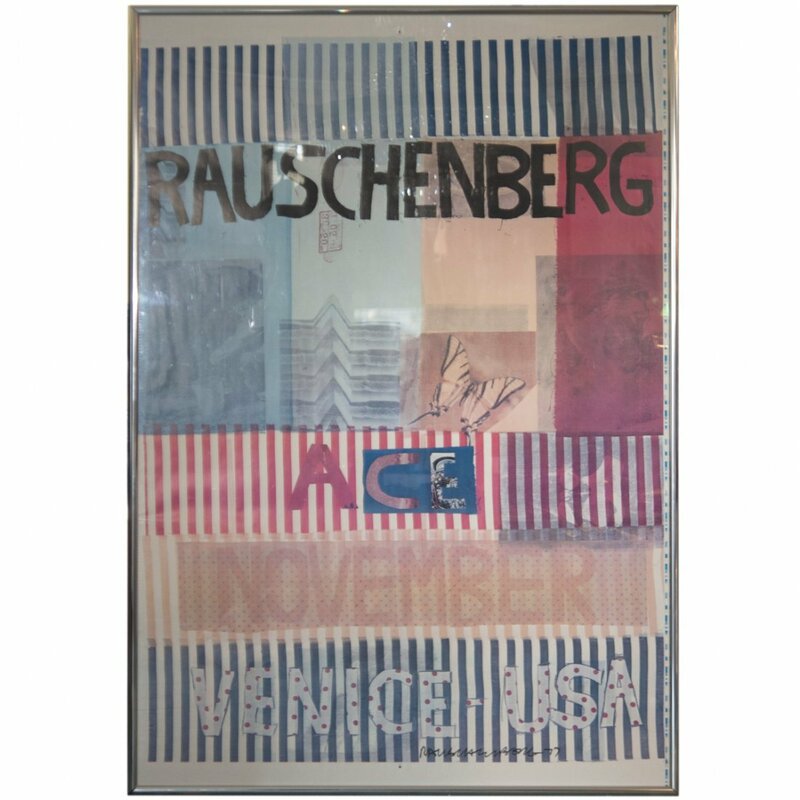 “Ace Gallery, Venice, California” is a first printing 1977 poster designed by Robert Rauschenberg for his exhibition at ACE Gallery in Venice, Calif. The poster is fully catalogued and referenced in the ‘”Rauschenberg Posters” book. This poster is signed by Rauschenberg on the bottom and framed behind glass. Known as a catalyst in the 1960’s for contemporary American pop art, Rauschenberg was born in Port Arthurrr, Texas in 1925. He studied at the Kansas City Art Institute (1946–7), the Académie Julien, Paris (1947), and with Josef Albers and John Cage at Black Mountain College, North Carolina (1948–50). He originally began experimenting with collages and mixed media works, sometimes incorporating sound so as to appeal to more innate senses. Later in his career, he honed his craft by experimenting with collages and photo transfers, unseen before that time. Ace Gallery, based out of California specializes in minimalism and contemporary pop-art. Exhibiting since its inception have been Andy Warhol, Robert Rauschenberg, Roy Lichtenstein, and a plethora of others. This piece will be featured November 9th, as lot #281 and is available for bids on liveauctioneers.com and invaluable.com.